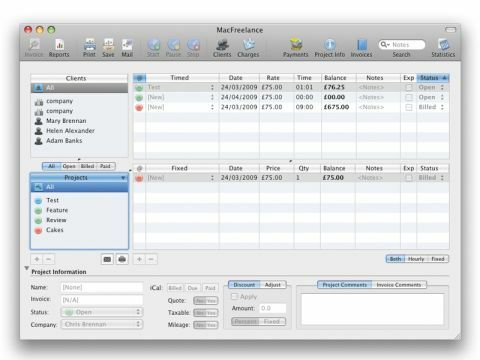 MacFreelance is designed to integrate seamlessly with iCal and Address Book meaning that you can get up and running with your invoicing and keep track of when to expect payments quickly. MacFreelance manages everything in a single window giving you quick access to its features. Clients, projects, invoicing and expenses can be easily tracked. Each client or project can have individually tailored options such as unique numbering or code identifiers. If you run multiple businesses you can group your clients together so that you definitely bill them from the right account. MacFreelance has a lot of features and, perhaps, that's one of its shortcomings. We found that it took a while to remember exactly how to use it. If you're running a business time is money and the longer it takes to learn an app the less time you have to actually do some work. That said, the integration with iCal and Address Book is good and there are more complicated applications out there. There's a great deal that's good in this application; we like the number of reports you can run to track and the fact that there's support for multiple currencies, if you need it. It's also refreshingly UK based in its options. For £39 it offers a lot, getting started might take a while, but in the long run it will make for a very robust invoicing and expense-tracking solution.